Have you heard the statement “Music and Mathematics are the same”? This book addresses some of the basic underlying mathematical concepts and connections with the music we listen to. The focus is quite rigorous and pragmatic and very much unlike most typical books in music. 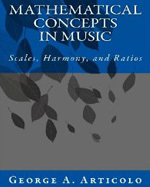 From the 12 tone scale and the vibration of strings, to the sensory perception of consonance and dissonance in tonal harmony, this textbook uses a mathematical approach to the numeric representation and quantitative analysis of musical objects. Maple was used in the process of writing the text’s mathematical material and graphics. Use of Maple permitted the export of worksheets to PDF files in order to embed sound files into the text.